Brian Grunert started his career as a college graduate and bass player who would rather practice with the band than look for a regular job. He has since found a way to take advantage of what Buffalo offers, ditch the stage, and start a business that mixes his love of indie rock with his love of making things irresistible to look at. His company and two others locally have found haven in this old steel city, designing posters and CDs for tattooed, tongue-studded rock musicians. For six years, Grunert has collaborated with Buffalo singer-songwriter Ani DiFranco to win four Grammy nominations for his CD package designs. A treasured gramophone trophy came his way in 2004 for the "Evolve" cover he created with an embossed moth photo and an iridescent blue sleeve that slides off to reveal a disc printed with a moth ball close-up. "There's this opportunity for designers to play along with the band, visually," said Grunert, 36, who started his White Bicycle design firm on Main Street last year. "It's just the simple desire to make things cool." Each of the three design firms -- of CDs, posters and letter fonts -- say they work from Buffalo for different reasons, which include: hometown musician clients, such as DiFranco and the Goo Goo Dolls; affordable rents; and a good network of suppliers. Their creations are sought after as people in the music business look harder for new ways to make money from concerts, T-shirts and posters -- as album sales drop and less-lucrative downloading increases. "I think that imaging and branding matter more," said client and Goo Goo Dolls rocker Robby Takac. "It's the thing people see before they hear the music." Takac, who started the Good Charamel record label in Buffalo four years ago, said he is glad to have access to Grunert. He likes Grunert's work for its "edgy" unexpected style, which has included a UPC symbol, usually hidden, in the dead center on the back of a CD for the pop punk girl band Juliet Dagger. Niche companies like Grunert's and Takac's add up to a small creative nexus that people hope will boost the city's economy. "Any city that finds success about being attractive to the creative class is going to attract people from the outside," said Edmund Cardoni, executive director of Hallwalls Contemporary Arts Center. "It's bringing a kind of artistic handmade quality to something that's high tech . . . They're sort of forging that design sensibility for our time." The 4-year-old Hero design studio on Allen Street was founded by a punk rocker from Louisville, Ky., who stopped here on tour and chose Buffalo to launch his national concert poster and design business for its inexpensive accessibility. The more established 13-year-old P22 Type Foundry has a collection of 800 letter fonts for license that have been used on about 1,000 different music CDs in the past decade -- including ones by Sting and former Beach Boy Brian Wilson. This firm started with digitized handwriting of surrealist Marcel DuChamp for a graduate school art exhibit. The company expanded beyond its original museum store clients in the mid-1990s when the Internet began making it easy for people everywhere to download fonts for $20. "I don't think we could have started our business anywhere else," said founder Richard Kegler about the low cost of starting here. The company, with an office in an old Victorian house on Elmwood Avenue, now has four owners and two regular free-lancers. Book publisher Random House is P22's biggest client. Music is a small sector for P22. Still, so many CDs designed with P22 fonts have appeared that the company had to stop buying them all for its archives. Sting's "Sacred Love" has Cezanne-style script from P22 and Brian Wilson's "Smile" is spelled out in a curvy font reminiscent of the beat era. Constructivist Russian style block print made it on the Pretenders' "!Viva El Amor!" album and "33" by the Smashing Pumpkins. P22 also has its own online record label for 12 bands: One CD of moody electronic music is named for an 18th-century font maker. The "William Caslon Experience" comes with a free bonus font and a letterpress cover designed by Kegler, who once sang and played guitar in his own 1980s band with Robby Takac. It's hard to explain why fonts, music and CD design go together, but P22 types are intended to evoke emotion, just as music does. Perhaps that's why they appeal, he said. "It's a similar creative outlet in wanting to make something," Kegler said, as alternative rock sounded in the background. "It is a creative piece in the end." The drop in CD sales may seem ominous to people in the industry, but downloading has increased, so overall music consumption is up. The cyber music experience has created new design opportunities, said Tom Calderone, general manager of cable music channel VH1. He sees promise in posters, fancy CD cases and T-shirts. People still want objects that make a physical connection to music -- even music transferred by mouse click. "You want to touch and feel that artist," said Calderone, 43, a graduate of Buffalo State College. Rock concerts he routinely attends now have laden souvenir tables. "There are more T-shirt designs at those tables than I've ever seen," he said. "I think the poster experience is going to be the next big thing." The designers at Hero say their silk-screened concert posters -- a growing business online and at music festivals -- get stolen minutes after getting posted. For the last two years, the three-partner firm, which includes a former and current indie band members, has grown by selling 65 different limited editions in runs of 100 or so for about $30. 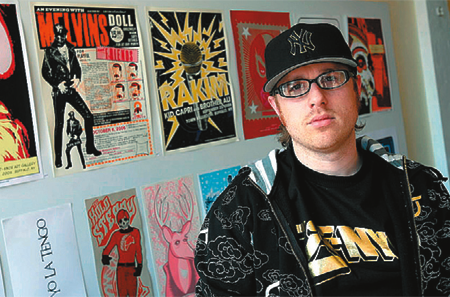 "Poster art is now about half our business," said Mark Brickey, 32, studio founder. "It's become our primary focus." Brickey discovered Buffalo while on tour with Enkindels, a pop punk band he sang with for a decade. This city was a favorite stop for its warmhearted fans and good, cheap Mighty Taco food. When he wanted a more lucrative career, he focused on design he'd been studying, got jobs using his music contacts, and moved. In Buffalo, he figured, he could start a business, do better than live paycheck to paycheck, and experiment. Hero opened on Allen Street in November to attract new clients and shoppers with shelves of wee "urban vinyl" toys for grown-ups -- yeti key chains and pink bunnies smoking cigarettes -- and posters. Good-selling posters, evocative of the music they promote, include the one for a folk-esque Decemberists concert that shows a yellow finch perched above what might be a bubbling blue sea. A poster for the blues-infused rock of Tragically Hip is a modified view of a handheld toy hockey game, in tribute to the Canadian band's roots. Revenue comes in from other clients, too. An Elmwood Avenue furniture store commissioned an illustration for business cards. The Coalition of Independent Music Stores hires Hero to create Web site banner ads and click animations for sampling songs. Although Brickey wants the same billboard and advertising work bigger firms get, he is after an unusual measure of creative freedom. Clients must agree to make only limited changes. Designs, such as a green sea horse poster for a Hallwalls show and a cyclopes punk concert T-shirt, should appear as created. "That's why I started my own business -- to do it my way," said Brickey, who has a tongue stud and tattoo sleeves. "It's our opinion that in a creative business like this, you've got to have a creative business model." Grunert, a Town of Tonawanda native who spent nine years of his career working for more conventional local ad agencies, said he decided to start his own design business of posters, CDs, logos, T-shirts for corporate, music and arts clients because he has the place "wired" already. He knows the right printers and photographers. If he moved, he would have to start over. He named his firm after a Dutch idea he likes for the way it inspired action. In the 1960s, white bicycles were left on public racks in Amsterdam for people to borrow and ride as needed. A good design is appealing like that, he said. A well done poster will inspire someone to "take a spin" and perhaps see a concert. This year, industry voters at the American Academy of Music thought he created something unusually good once again and nominated him and DiFranco for another Grammy for the 2006 release "Reprieve." For the design, Grunert played on a lyric -- "I'm in the middle of Hiroshima/ watching a twisted old eucalyptus wave . . ." The cover is embossed with a drawing of a broken tree from a photo taken after a bombing. Inside is another slim box that holds the CD has and an embossed tree in full leaf, as if recovered. "This is the imagined part," he said, rubbing the paper. Grunert says it's funny how he wound up making a living like this. Designing for music was a fleeting ambition when he was a kid. Then one afternoon seven years ago, he interviewed for an ad agency job he didn't want, and spent the lunch talking about music design and CD he once did for his old band, putting an elephant, a turtle, skeletons and a tree on the cover. That conversation led to a referral. Within a year or so, he was working with DiFranco. Her own aesthetic meshes with his design variations. In a way, he said, their success is a tribute to their history with Buffalo and its latent power to encourage do-it-yourselfers and new cool. "The Buffalo music scene," he said, "is kind of sneaky like that."